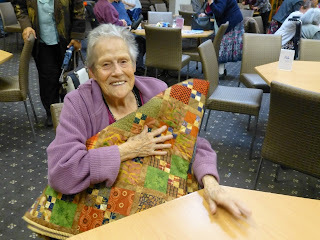 Every year the members of WQC make community quilts. to raise funds for the visitor service. with Sue Campin from Age Concern. The happy winner of the raffle is Isobel Wilson. Western Quilters Circle Inc was established in 1984. We meet at 7.30pm on the last Tuesday of the month at the Kelston Community Centre. We hold an annual exhibition "Quilts Across the Ranges"